The Paws & Affection team brings service dogs in-training and staff to your school/organization/group for an educational and interactive learning experience. Read more about our two programs below. Our presentations are tailored to every group’s unique needs and age-range. This month-long program allows students to learn about service dogs through hands-on participation in the training process of a Paws and Affection dog. Each week, students enter the world of service dog training under the guidance of a professional dog trainer. This program is limited to small groups of ten students or less, allowing students to work together in teams with a P&A canine partner. Students enjoy bonding with our dogs and benefit from practicing positive reinforcement, patience and cooperative teamwork, too! 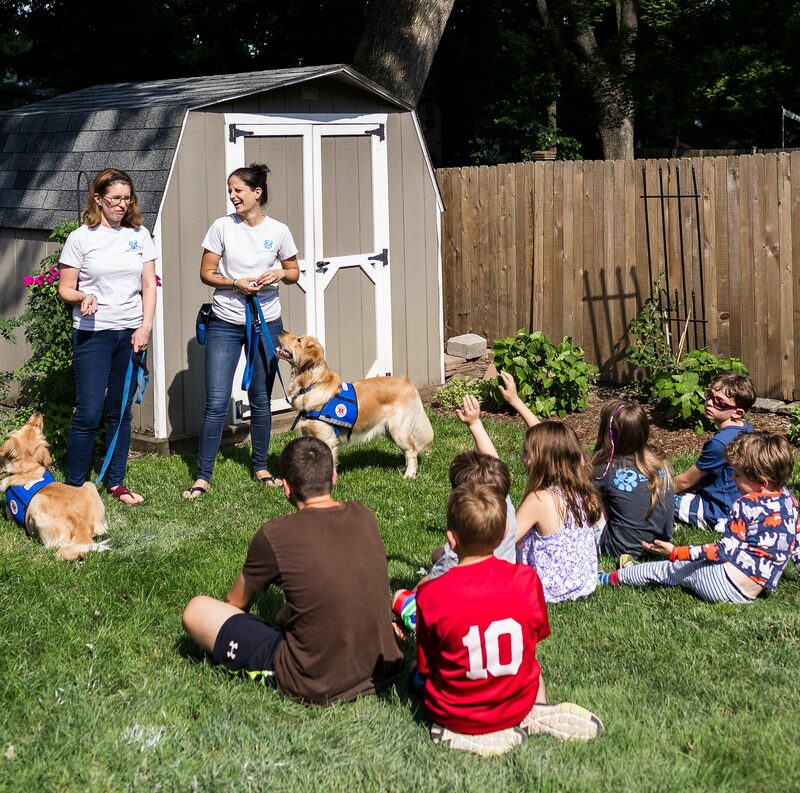 Students gain a deeper understanding of how service dogs help people with disabilities, while also learning some essential principles of caring for and teaching these special animals. Students gain better awareness of disability-related rights and challenges, while learning best practices for respectful interaction with a person that has a service dog. Examination of the specific ways in which dogs express emotions. Students compare differences in human and canine body language in order to understand and practice more effective communication with dogs. Discussion and exploration of the importance of positive reinforcement in animal and human learning through dog training games and exercises. Students gain greater understanding of the negative impact of stress and fear on learning, and how positive reinforcement strategies may be utilized in their own lives. Students learn and practice tasks essential to caring for our dogs, including proper grooming, equipment and daily care. Students develop a broad understanding of how a dog’s needs change over time, and what we can do to meet these needs.